Home » News » Audit shows turn-outs could be the answer to slow movers! Audit shows turn-outs could be the answer to slow movers! Is there anything more frustrating than being stuck behind a vehicle doing 90 in a 100 zone? Yes – being one of ten cars unable to pass a vehicle at 80k or 70k! Unfortunately, this is not rare occurrence. For the last three years, Tony Stewart, Secretary of the Rainbow Beach Commerce and Tourism, has been corresponding and calling the Minister for Transport and Department of Main Roads DMR. And the common response is that passing lanes would be implemented in preference to turn-out bays. While it is acknowledged that a series of passing lanes would provide a better outcome to alleviate this situation, clearly the cost of providing passing lanes should be significantly higher than the construction of turn-out areas. 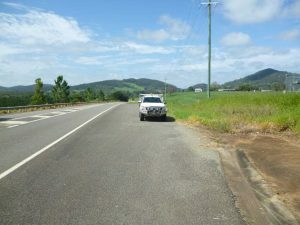 This type of facility is used on rural roads in other Queensland shires and it is considered that construction of a number of turn-out bays for eastbound and westbound traffic on the Tin Can Bay – Gympie and Rainbow Beach Roads would provide a notable increase in road safety along these routes. The Tin Can Bay – Gympie Road and the Rainbow Beach Road both carry significant volumes of tourist traffic, including caravanners, fishers (towing boats), and internationals in camper vans. Typically, many of these motorists are new to the area and are not familiar with the roads and so tend to travel slower than the ‘regular’ traffic that includes commuters and regular users. This situation results in frequent and significant platooning of traffic behind slower vehicles, which generates frustration in some motorists and results in some dangerous passing manoeuvres because of the very limited passing opportunities along the route, whether travelling to or from Gympie. In an attempt to demonstrate the feasibility of this proposal, a road inspection was conducted with Mr Bob Spencer, civil engineer/project manager with many years experience in road design and construction, and previously Director Engineering with North Burnett Regional Council. Tony and Bob identified a number of locations where turn-out bays could be constructed on the Tin Can Bay – Gympie Road. Rainbow Beach Road is yet to be audited. Their letter was unanimously endorsed by the RBCT, and Tony will continue to persist with the departments and now Council, who sit on the Traffic Advisory Group. Have you ever seen snow falling over Double Island Point before?